Mozo is a small helper system I built as a low cost video editing workstation. It was built to replace an existing K6-233 that just was not cutting it for long MPEG encoding. The selection of the components for Mozo, like many of my recent systems, was strongly influenced by reviews on many hardware review sites. I finally settled on a Tyan Trinity 400 (S1854) motherboard, 128 MB of Crucial CAS-2 PC133 SDRAM and a 500 MHz Intel Celeron processor. 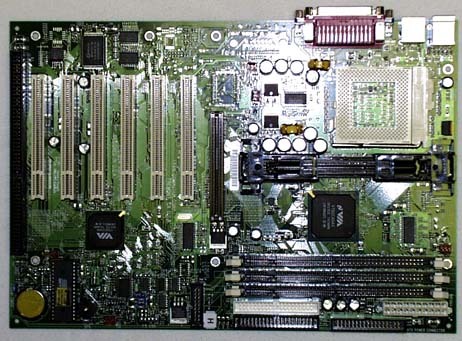 The motherboard supports both PPGA-370 and Slot1 processors allowing me to upgrade to faster cpu's as funds allow. The CAS-2 PC133 SDRAM is overkill for the 66 MHz FSB celeron but is fast enough to work with the fastest processor the motherboard supports. A new Addtronic 6896A case was purchased for this project. I pondered long and hard on the case for this system before picking the 6986 over the SC750 like I used on Wimpy. A 20 gig IBM 75GXP 7200 RPM IDE hard drive was purchased to supplement the existing 6 gig video drive. All other components were taken from the old video capture system. Building Mozo has proven again that no matter how much you do your homework, things can, and will, go wrong. My first complaint is with the Addtronics 6896. Addtronics listened to feedback from its customers and switched from philips head screws to thumb screws. Unfortunately, there is no room to get your fingers around the thumb screws, so you end up using a flat head screwdriver to knock them loose. This is a major pain to me since the only tool I normally keep around when working on PC's is a 1/4 inch driver. Aside from this little nit, the Addtronics case is a very nice case. The second hurdle I had was sourcing parts. I started off by ordering a boxed 500 MHz Celeron and the Tyan Trinity 400 from Egghead. They had the lowest price around when I used the free shipping coupon. The motherboard arrived three days later but the CPU was put on barkorder. Two weeks on backorder and I canceled it went back to my friends at Dynasty Express for a 600 MHz Celeron2. It cost 50 dollars more for an OEM CPU plus heat sink but I figured it was worth it to have a little more processing power for less than half the power. Finally the parts arrived and the assembly began. I can not believe that all the people who recommend the Tyan Trinity 400 have ever installed one. The board certainly looks nice from its picture but reality paints another picture. Let's start with the LED and switch connectors. Tyan put them on a dual inline header in the middle of the board instead of the more conventional well labeled single inline headers along the bottom. Pin numbering on that header is totally contrary to normal header standard. It is virtually impossible to install this motherboard without the manual in front of you. Next comes the CPU installation. The metal lever on the S370 socket is wedged in close to the SLOT1 socket. I had to use a screwdriver to get the lever open to install the processor. Installing the fan retaining clip was a major pain on a motherboard already mounted in a case. I had to take the back cover off the case and reach in through the back to lock in the retaining clip. Finally, I do not know if this is a case problem or a motherboard problem, but I am going to blame it on the motherboard just because. The mounting holes on the back of the board do not line up with mount points on the Addtronics case. The closest ones are several inches in from the back of the board. Installing the hard drive cables requires lifting the motherboard with one finger while pressing on the IDE cable with your thumb unless you want to risk breaking your motherboard. All in all, the assembly of this system left a lot to be desired. Next comes the BIOS. For the most part, the BIOS on the Trinity 400 is not much different from any other BIOS. The main exception is in the memory tuning parameters. Just looking at all those options gives me a pretty good idea why memory performance on the VIA based motherboards is reported to be so bad. Going through all these options to find which settings do what is a major undertaking. I found the setting I think sets the CAS Latency and dropped it to 2. I did not recognize any of the other settings so left them alone. Initial testing of the system looks good. The CPU stays ice cold even after a half hour running RC5. The Via chip sets do get slightly warm to the touch but nothing to worry about. The IBM 75GXP does get noticably warm sitting on the bench so proper mounting with decent ventilation is required. My frustration with the motherboard continues to mount when I try to measure the temperature of the CPU so I can see if it is safe to run without a fan. Guess what, the Tyan Trinity 400 does not have ANY temperature monitoring capability. I guess I should have checked the specs a little more carefully before I bought it. The first sign of real trouble was after 30 hours when the RC5 client crashed. This is the version of the client that has been running non-stop for about a year on one of my machines. The second sign of problems was when I sat down to install Windows. Talk about a major pain in the rear. Windows would not install. After fiddling bios settings, reformatting hard drives, checking and double checking cables I tried swapping RAM. Low and behold, the S1854 does not like brand name Crucial PC133 CL2 RAM recommeded by both Crucial AND Tyan. Windows installs just fine with a pair of generic 32meg PC66 sticks taken from my web browsing machine. I then swapped the Crucial PC133 for a pair of generic 64 meg PC100 sticks on a P2B motherboard where the Crucial RAM seems to works just fine. My kids games seem to lock up with the same frequency as before. The Tyan seems to take these generic PC100 SDRAM's from that machine. It just did not like the Crucial PC133 sticks. So, the Crucial is in the family machine, the two 32 meg sticks are back in my web browsing machine and a pair of generic PC100 sticks are in Mozo. 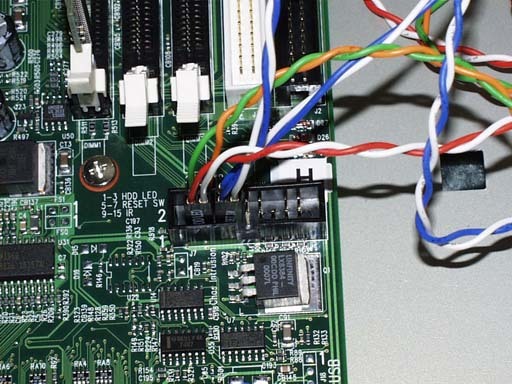 I would hate to think what a first time builder would do who did not have a ready supply of spare parts to swap in order to debug this finiky board. I have been running the windows version of RC5 for over a week now and the system seems stable. I captured a half hour of CIF video with no frame drops to the 75GXP. I have not installed Ulead MediaStudio yet so can not tell how it runs as a video editing machine. Thus, I do not know if the nightmare with this system is almost over, or just beginning..